WHEN DAD MENTIONED AN OLD GIRLFRIEND’S PIE, MOTHER SURPRISED HIM WITH ONE OF HER OWN. MOTHER PREPARED A FORMAL DINNER WITH DESSERT every night of the week for her husband and four children, and the six of us ate together, at the table in the dining room, Dad at one end and Mom at the other. Whenever the dessert was cream pie, Dad would ask, “Did you know I married your mom because she made the best pie I ever ate?” Then he would pause and chuckle. “Even better than Josephine’s pies,” he would add with a wink in mom’s direction. Then he’d retell the Marquis family story. ON THE DATES THAT FOLLOWED, they frequently went dancing, as this was the big band era. After dancing, they would often stop at a diner for some pie and coffee. Dad loved pie and had a unique way of eating it. He’d always tell the waitress to “Put the pie in a bowl and pour milk over it”. One night he happened to mention that his old girlfriend Josephine had made him a pie. 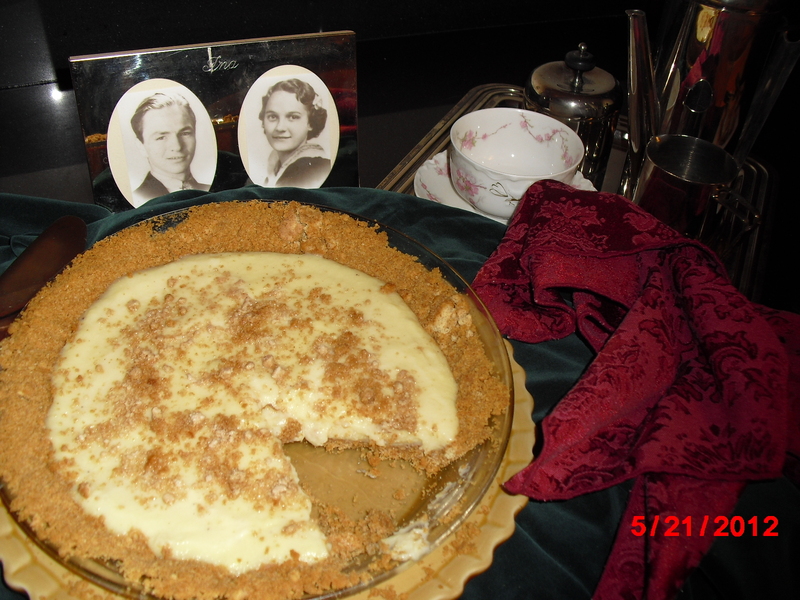 Mom didn’t answer, but the next time he picked her up for a date, she had her old-fashioned cream pie waiting for him. “THAT WAS THE BEST PIE I EVER ATE”, Dad always said. “I decided right then that I was going to marry this girl.” In December, 1938, Ina and Harold eloped and were married in Ashland, Kentucky. They were each 21 years old. MY PARENTS HAD A LONG LIFE together filled with many blessings. They were graceful ballroom dancers and enjoyed dancing well into their 80’s. 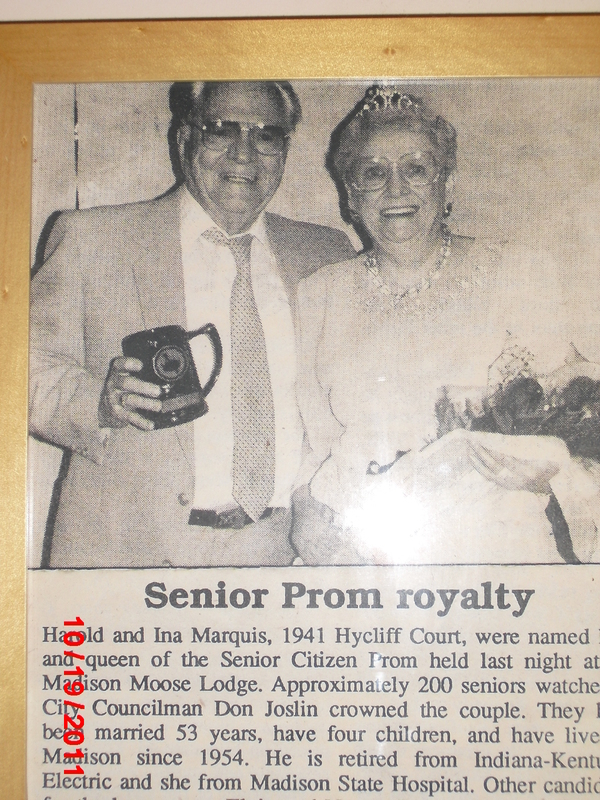 They both arrived in the world in 1917 and they both died in the same year – 2008 – after 70 years of marriage. I miss them every day. OUR EXTENDED FAMILY of children, spouses, grandchildren and great grandchildren now number 22. All the Marquises know the story of the cream pie that started our family. We still make it sometimes and whenever we do, we retell the story, as we eat every bite of this delicious dessert and lick our forks. Preheat oven to 350 degrees F. Blend graham crackers in food processor or a few at a time in blender. Add sugar and mix until finely ground. Add melted butter and combine well. Reserve 1/4 cup of graham mixture. Press remaining crumb mixture into bottom and sides of 9-inch pie pan. Bake about 7 minutes until lightly browned. Cool while preparing filling. In large saucepan, whisk sugar, salt and cornstarch. Add milk and egg yolks and whisk well. Heat mixture over medium heat, whisking constantly until mixture begins to bubble, then cook one (1) minute longer. Remove from heat and stir in vanilla, nutmeg and butter. Cool filling by placing pan in ice water, taking care not to let any water spill into filling. When filling is just warm, pour into baked crust. Cover with plastic wrap and refrigerate for four hours or overnight. Before serving, sprinkle with reserved graham cracker crumbs. Add a few raspberries on side of plate when serving pieces if desired. THIS PIE IS SO SCRUMPTIOUS THAT MY FAMILY OFTEN EATS IT STILL WARM WITH A SPOON, NOT WAITING UNTIL IT FIRMS UP TO SLICE. I also sometimes just make the filling and layer with angel food cake in a stemmed glass with fresh fruit – an impressive and delicious dessert for a dinner party.